Your Values – Your Key to Contentment - Marci R.D. I take that feedback seriously!! My clients trust me to join with them on their life journeys and that is a privilege. I like to hear about every facet of their life so I can understand how food and body image issues fit into the larger picture. My office is a not a one stop shop for a meal plan. I look for the meaning and symbolism in their food and body issues. That teaches me all about what struggles lurk beneath the symptoms and helps us discover genuine solutions. Attempts to fix oneself through food and body projects can never resolve the deeper pain that lies at the root. 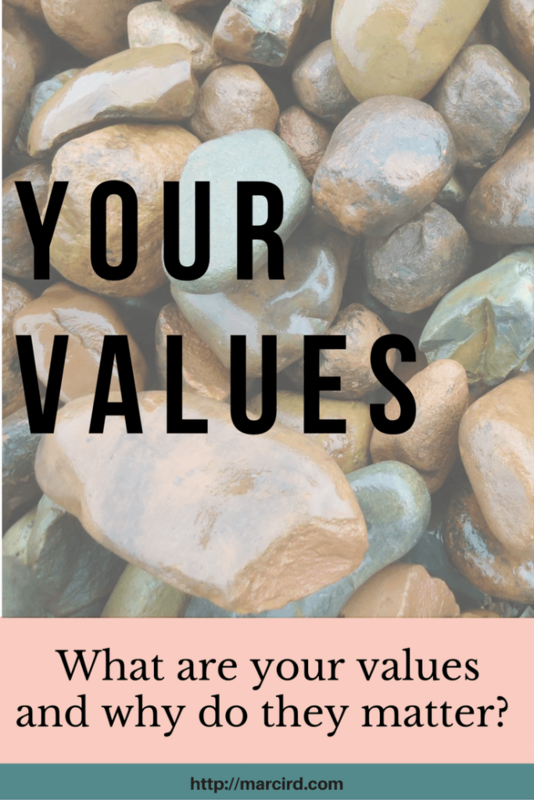 I work with my clients to help them to connect to their core values. I believe that living out of alignment of your core values is a key source of pain and suffering. And living a life that lines up with your core values, even when crappy things happen, brings contentment and peace. In fact, I talked about this in my interview with Fiona Sutherland on her podcast “The Mindful Dietitian.” In that episode, I share a lot about my own relationship to mindfulness, how I went from skeptic to believer, how mindfulness has helped me in my personal and professional lives, and how it relates to self-compassion. Another key to component I discussed in that episode is the importance of completing a values-based inventory. And today, I’d like to invite you complete one! It may feel a little challenging but I can promise you, it’s totally worth getting to know yourself better. Step 1: Review a list of values. Below is an example but you can also google “list of values*” to find one that you like! Step 2: Choose your top 10 values and write them down. Step 3: Narrow the list to your top 5 values. Step 4: I know this is painful, but narrow it down again to your top 3 values. And if you are feeling brave, head on over to facebook.com/marciRD and share one of your top values and one specific way you’d like to live more in alignment with that core value. Since we’re all in this together, I’ll go first. Click over to Facebook for the conversation. Hope to see you there!